As you gather up last minute Easter basket goodies and treats, don't forget to check out the wide assortment of Bazooka Candy Brands products including their new spring-themed Ring Pops, which are arriving on store shelves nationwide just as the winter melts away. 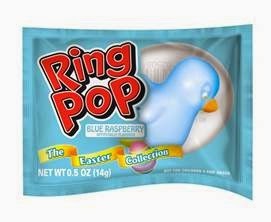 As you can see in the above photos, these Ring Pops come in cute pastel colors in both bunny and baby chick shapes. I used to love Ring Pops as a kid, and still sneak one or two when my girls get some around the holidays. :-) Come on, you know you do, too! 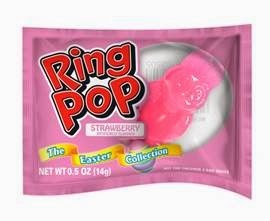 I can definitely see these spring-themed Ring Pops being a hit with kids of all ages this Easter when they find them in their baskets. Remember I said I had a giveaway...well, if you want to win some of these Ring Pops to add to your child's Easter basket, simply complete the entries on the Rafflecopter form for your chance to win. And, special thanks goes again to Bazooka Candy Brands for sending me some of these Ring Pops to add to my girls' baskets, as well as offer as a giveaway to my readers. Want to win some Easter-themed Ring Pops to put your child(ren)'s Easter basket? Then, complete the entries on the Rafflecopter form below. Good luck! Bazooka Candy Brands is a division of The Topps Company, Inc. Founded in 1938, Topps is a leading creator and marketer of sports and related cards, entertainment products, and distinctive confectionery. Topps entertainment products include Major League Baseball, National Football League, and other trading cards, sticker album collections, and collectible games. The Company's confectionery brands include "Bazooka" bubble gum, "Ring Pop," "Push Pop," "Baby Bottle Pop" and "Juicy Drop Pop" lollipops. For additional information, visit www.topps.com. My son and daughter would love them!